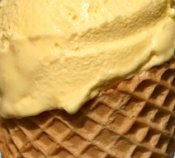 Vanilla is the most popular ice cream flavor in the world. If you want to use real vanilla along with cream, milk, eggs and sugar, then click on the picture for my recipe which gives a rich and oh so creamy treat. A great dessert to make for the kids or just simply when you're in a hurry but need an ice cream fix! Method: Pour all ingredients into a mixing bowl and mix until smooth. Transfer the whole mixture into an ice cream maker and freeze according to the manufacturer's instructions. Vanilla ice cream is one of the most popular flavors - here are some more recipes for homemade ice cream to help you on your way. Ice cream making is such fun and, like many other things, once you've developed a passion for it you just want to keep going and try lots more. Once you've made your ice cream, choose from a wide range of toppings to help make it that bit extra tasty and appealing. Click here for my list of ice cream topping ideas, including my own toffee sauce recipe.